Director: Alec Mills / Writer: Robert Brennan / Cast: Leon Lissek, Christine Amor, Helen Thomson, Ian Williams, Craige Cronnin, Hazel Howson, Christophe Broadway, Suzie MacKenzie, Anya Molina, Samantha Rittson, Jo Munro, Michelle Doake. Soppy Neighbours-esque romance is married to some Friday the 13th shenanigans in this fairly impressive Aussie flick that has the one flaw of revealing the killer’s identity about halfway through the film. The girls of St Elizabeth’s Catholic boarding school are being offed by a shadowy killer, who uses a length of barbed wire to garrotte them, along with the occasional boyfriend. Pretty daughter-of-someone-famous Mary is unknowingly high on the killer’s list. The stalk n’ slash scenes are well handled, a standout being when two girls sneak into the school to steal an exam paper and run into the killer, who quickly dispatches one and chases after the other. 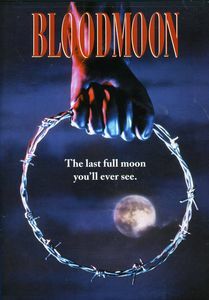 Bloodmoon, however, commits that cardinal sin of allowing one particularly unpleasant character to live, when hordes of comparably innocent ones have been laid to waste. Elsewhere, excess T&A negates some of the up-market style, but for an alt perspective teenie-kill film, it hits enough of the right notes, despite not quite making enough of its Aussie-ness. Just ignore some of the crimes against hair. I recall enjoying this and that the twist involved some deranged couple. I think I need to see this again soon! It’s not particularly gory – but it’s still fairly high-end. The teen romance stuff just clogs it up.